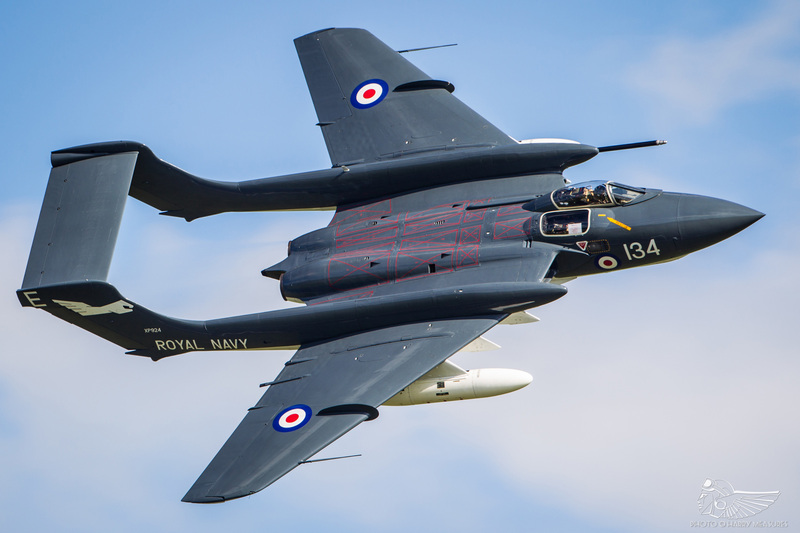 On Saturday, 27 May 2017, de Havilland Sea Vixen XP924 (G-CVIX) suffered hydraulic issues following a successful air display at Duxford and its pilot, Cdr Simon Hargreaves, performed a wheels-up landing at RNAS Yeovilton. To support the aircraft’s repair and return to flight, you can visit the Navy Wings Sea Vixen Appeal 2017 web page and make a donation. When de Havilland Sea Vixen D3 XP924 (G-CVIX) returned to flight under civilian ownership in 2000, ex-military test pilot Dan Griffith was responsible for conducting the test flying regime – here, he recounts his impressions of flying what was then the UK’s most complex civil-operated classic jet. Manufactured by Hawker Siddeley Aviation Ltd in 1963, XP924 was one of the last Sea Vixens to enter Royal Navy service. Allocated to 899 Naval Air Squadron in 1964, the Vixen flew from RNAS Yeovilton and the aircraft carrier HMS Eagle prior to transference to Llanbedr, where it was utilised in radar test trials before conversion to D3 configuration as a drone. Its service life concluded in 1991 following a four-year stint at Llanbedr and the aircraft was later acquired by Gwyn Jones who, along with former Sea Vixen pilot Marcus Edwards, initiated the lengthy restoration to flight process and placed the aircraft on the civil register as G-CVIX. 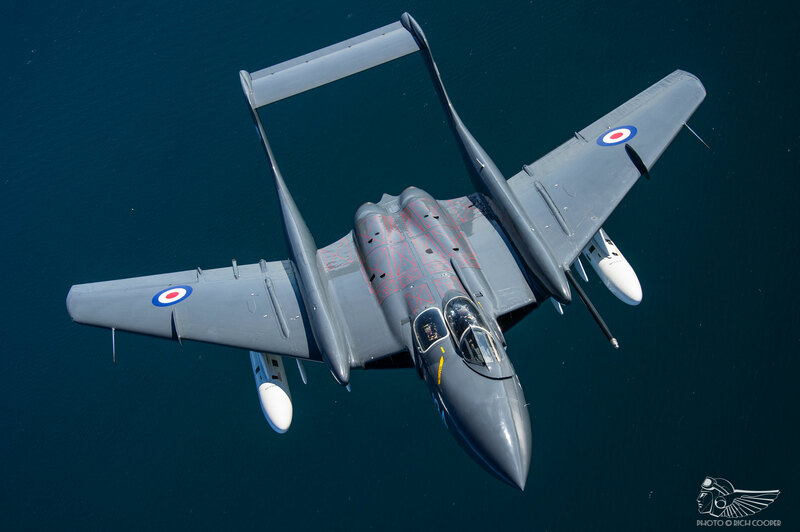 Dan Griffith began his association with the Sea Vixen at the turn of the century, as de Havilland Aviation Ltd’s ambitious plans to restore the aircraft to flying condition reached a positive conclusion. Dan has tremendous experience in the fast-jet field, having initially cut his teeth on the Royal Air Force’s Harrier GR3s during 1(F) Squadron’s formative years with the type, accumulating over 1,200 hours on successive Harrier variants throughout his career. Stints at Edwards Air Force Base, Bedford and Boscombe Down followed, putting him at the controls of dozens of aircraft as a research and development test pilot, among them the A-7 Corsair, A-10 Thunderbolt II, F-15 Eagle, F-16 Fighting Falcon, Tornado GR.1, Jaguar GR.1 and NASA’s F-18 HARV test platform, as well as heavier multi-engine types such as the C-130 Hercules, C-141 Starlifter, C-5 Galaxy and B-52 Stratofortress. Upon leaving the military in 1996, Dan continued his career as a test pilot in the civilian world, notably performing much of the regulatory flight testing on the Airbus A380. He has also made an impression on the European airshow circuit during, displaying numerous vintage aeroplanes and classic jets over more than two decades ranging from First World War replica biplanes and triplanes to the likes of the Meteor, Hunter and Canberra. 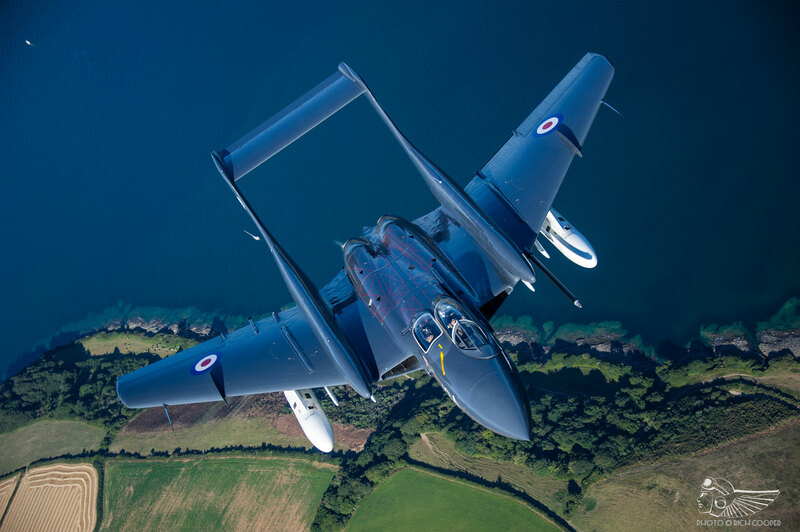 Following Marcus Edwards’ untimely death, Dan was asked by Gwyn Jones to conduct the post-restoration Civil Aviation Authority (CAA) air testing and development flight-testing of the Sea Vixen. “It was a huge responsibility,” he reflects, “which is something that people forget, I think. It was Gwyn Jones and Marcus Edwards’ dream. The engineers had worked on it for years, and hundreds of thousands of pounds, if not more, had been poured into the restoration. It was, at the time, the most complex aeroplane that the CAA had allowed to fly on the civil register, which added its own pressure. The aircraft was going to be the sole airworthy example, and was very high profile in the aviation community as a result. That weighs on your shoulders, and you’re taking an awful lot into the air with you!”  It’s a burden Dan understands well, having test flown numerous unique restorations and recreations – including the Gloster Meteor T7 and Travel Air Mystery Ship in more recent years, to name two prominent examples – but he has encountered nothing else of the Sea Vixen’s calibre in civilian life. “It’s extremely rewarding, exciting and frightening all wrapped into one!” Dan’s experiences in the fast-jet test field placed him in excellent stead to approach the test regime of the Sea Vixen – a classic jet, yes, but one “at the top end of the intermediate category, which was a moot point because it could have easily slipped into the complex category. A methodical approach to test flying new aircraft saw Dan spend a number of hours conducting both low and high-speed taxy trials whilst the Sea Vixen’s paperwork was under consideration with the CAA. This enabled Dan to acclimatise himself with the Vixen’s behaviour in a ‘safe’ environment and get a feel of how the aircraft handles up to the point of take-off. Following a long-term restoration, this approach also helped affirm confidence that the aircraft’s flight controls had been connected correctly and were all in working order. “That may sound odd, but there have been aeroplanes that have got airborne and the pilots have found the controls weren’t connected correctly – people have been killed that way. The ground taxying assists with giving you confidence that everything is connected and working correctly following deep restoration and maintenance, and the understanding of how the systems work in practice. The first flight shouldn’t offer any surprises in that respect. 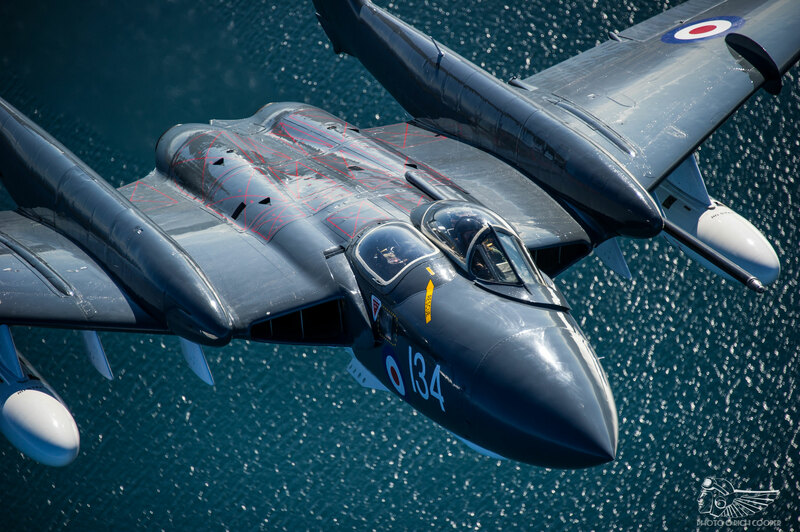 Those sensations made an impression when the Sea Vixen finally found air under her tyres for the first time in years, as Dan held the aircraft on its brakes at 80% throttle before releasing and opening the throttle to full power for take-off. “It had a massively quick acceleration”, he enthuses, “with an almost 1:1 thrust-to-weight ratio at the fuel levels we used”. At 100-110 knots, the Sea Vixen started to rotate, and it was airborne by 140, “getting off the ground like a scalded cat and climbing like a homesick angel with its extremely powerful engines”. It easily achieved its operational climb speed of 370 knots, albeit Dan found it climbed to 10,000ft without any difficulty at a conservative 250 knots. The first flight was a 25-30 minute general handling sortie with a sequence of pitches, rolls, turn reversals, engine management tests, flight system monitoring and so on for familiarisation purposes. Dan remembers the Sea Vixen being “very impressive” during that first flight, surmising that you can glean the majority of your opinion of an aircraft during the first ten minutes of flight testing, with the subsequent five to ten hours of testing essentially affirming those initial impressions and delivering concrete flight data. “It felt like a big, go-to-war, powerful aeroplane – not too dissimilar to the Phantom or Tornado class of jet, from the general in-cockpit feel. The cockpit may have been archaic, but performance-wise it was more akin to a more modern jet within that bracket. It’s quite overpowering in some respects. At the mid-level speed range, however, the Sea Vixen is a real sweetie with no notable vices.  An optimum roll rate can be achieved at around 370 knots where it “goes like a dingbat”, and it is capable of all standard aerobatic figures. It was an ideal ‘act’, then, for the air display environment that the aircraft went on to thrive in from 2001 to the present day. Indeed, Dan had the distinction of piloting G-CVIX during its first display season back in 2001, débuting at the Duxford Spring Air Show in May. 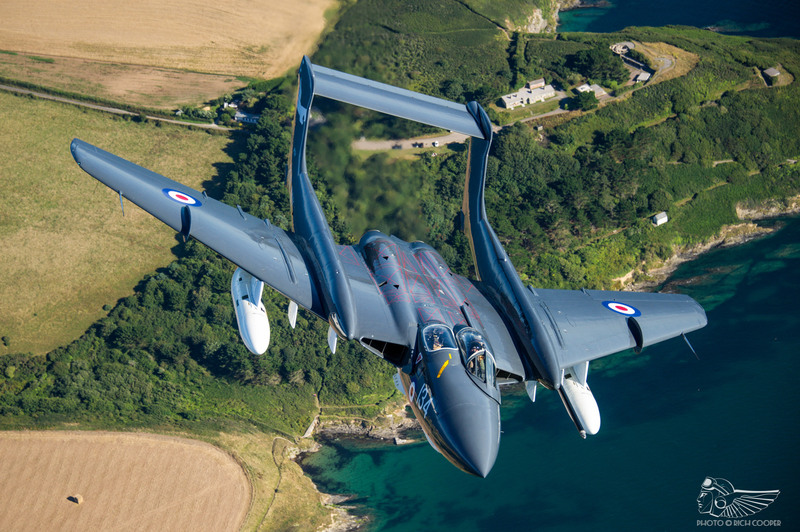 “The Sea Vixen is so over-powered, it was one of the only aeroplanes that I had to actually think about throttle usage during a display”, he says. “Most aeroplanes you tend to set a display power – max continuous thrust in jets, for example – and tend to manouevre to kill off energy. With the Sea Vixen, I had to use the throttle all the time, otherwise I’d be far too fast to be able to reposition tightly”. One of the Sea Vixen’s traits is its ability to transition from 130 to 550 knots “almost instantaneously”, permitting a display speed range of 400 knots. “That made it a very exciting aircraft to display”, Dan recalls, and the result was a sequence that looked far more aggressive than it actually was, with high-speed passes leading to tight turns as the combination of air brake and induced drag from the aircraft’s 648 square foot wing area naturally bleeding the speed off in the turn. “What I tend to do when putting an aeroplane like this into an airshow environment is to display for the crowd and the photographers. I try to keep relatively close and put as many angles into the routine as possible. That’s my general philosophy for display flying; I don’t fly loops, rather half-Cubans, and my gate heights and speeds are different to some people as a result. Once you know the minimum speed needed for a half-Cuban, you know what speed you need to be for any vertical figures, such as rolls or obliques. I would position behind the crowd and run in at the maximum speed I’d dare come in at, close the throttle and enter a slower speed display that comes in on the 45 degree axis, the 90 degree axis, the A-axis, top side, belly-up and so on. I tried to build that into an eight minute display to suit the respective venues”. His standout displays included the very first public outing at Duxford and a private solo before a crowd of former Sea Vixen pilots at Yeovilton in September 2001. “I don’t know what happened during that display, but it was absolutely electric. I knew the aeroplane well, having flown it for six to seven months, and it just all came together.”  Indeed, Dan cites the Sea Vixen as “the most exhilarating aeroplane” he has flown in the airshow environment, a unique classic jet which has left a lasting impression on him for many years hence. His enthusiasm and affection for the ‘Foxy Lady’ shines through more than a decade after his last flight in the aircraft. Whilst Dan no longer flies the Sea Vixen, the aircraft has remained a popular – if elusive – performer on the UK airshow circuit since 2001. 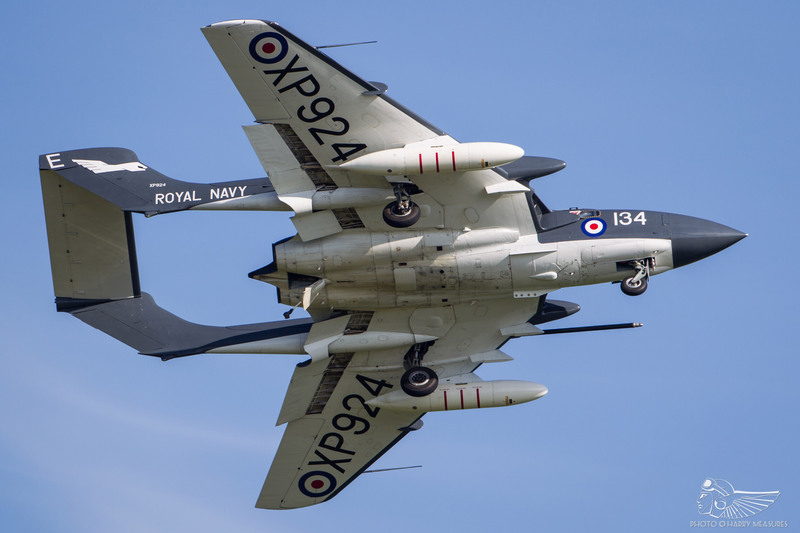 Under the care of Naval Aviation Ltd and the Fly Navy Heritage Trust at RNAS Yeovilton, Somerset, G-CVIX will hopefully (repairs pending) continue to represent an important era of classic jet development by thrilling airshow crowds for years to come.